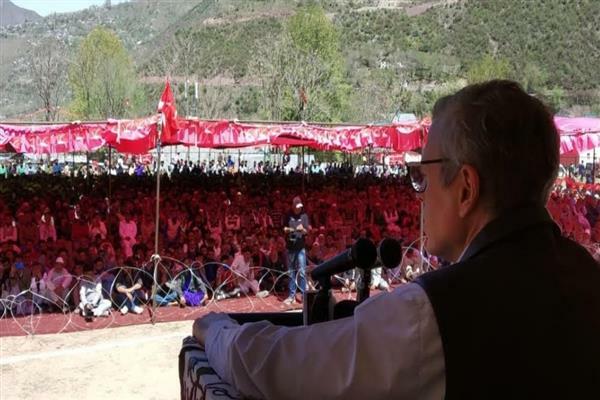 Srinagar: National Conference (NC) vice President Omar Abdullah on Sunday asserted that BJP and Peoples Conference (PC) were two faces of the same coin. He said these forces were hell bent to obliterate the special status of the state are coming forth holding lotus and Apple in their hands saying that people across the state should beat their nefarious designs by actively participating in the ensuing Parliament elections. Omar said that the biggest problem that the state is facing is that of unemployment and any stride on Art-35 A will have far reaching consequences on the employment prospects of our youth.